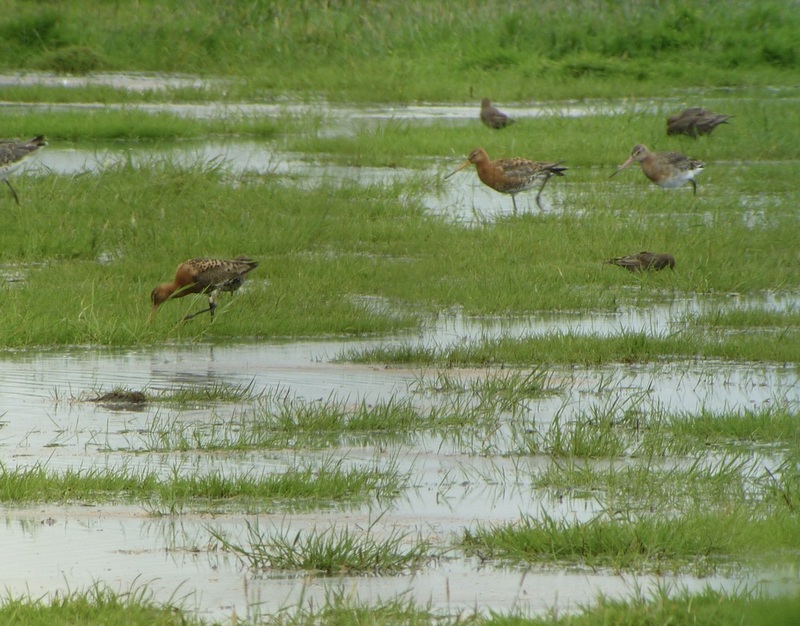 Until recently we have seen small numbers of black-tailed godwits in this part of the river, but in 2011 the numbers increased to almost a thousand birds and they are now using the estuary annually.. As the tide comes in they fly to Hale Marsh were they can be seen roosting from the bird hide. 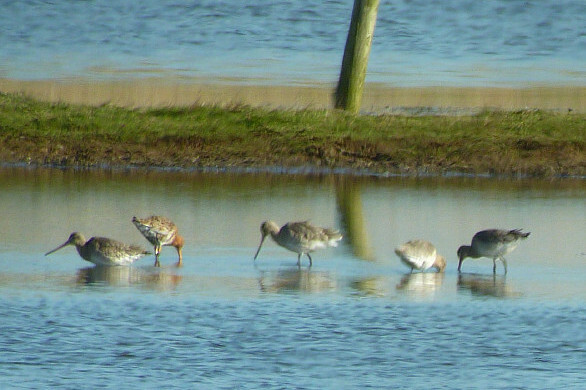 Small numbers moved onto some of the freshwater pools on the higher reaches of the marsh. Numbers continue to increase. They usually arrive in July on their return migration: a lot of these birds are brick red - their full breeding plumage. Gradually they change into their winter plumage. There are also young birds with them in their juvenile plumage. There are two separate races of black-tailed godwits, one race breeds in Europe from Holland through to the Baltic States (Limosa limosa limosa): the other race breeds in Iceland (Limosa limosa islandica) It was thought that the birds at Pickerings Pasture LNR were of Icelandic origin and this has been confirmed as several birds were carrying colour rings on their upper tarsus. 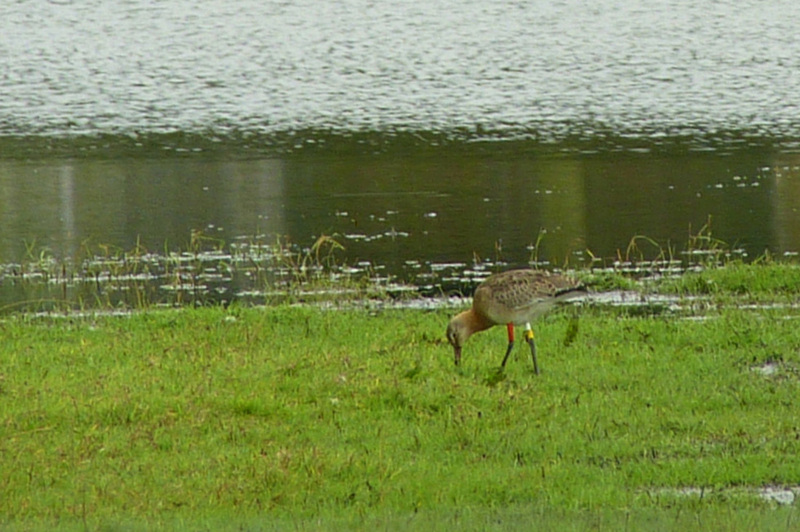 This black-tailed godwit RO-WYf was photographed at Carr Lane Pools, Hale. 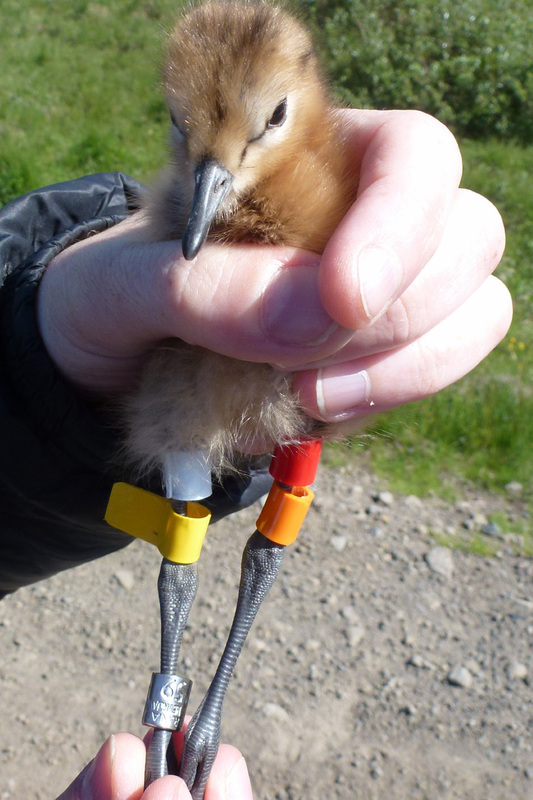 It is shown below as a chick in Iceland..
for the winter instead of going into southern Europe where they were more likely to be shot by hunters. The results from colour-ringed birds make very interesting reading – one found amongst the high-tide roost from the hide on 8th August 2011 was ringed Green over Orange: Lime over White (GO-LW). It was ringed on the Wash Estuary in Lincolnshire on 9th September 2002 at Holbeach. It was probably an adult when it was ringed, so the bird was over ten years old. It is not unusual for Godwits to live until they are fifteen, if all goes well. It was next reported at Cley in Norfolk on 24th March 2003 where it remained until 22nd April. 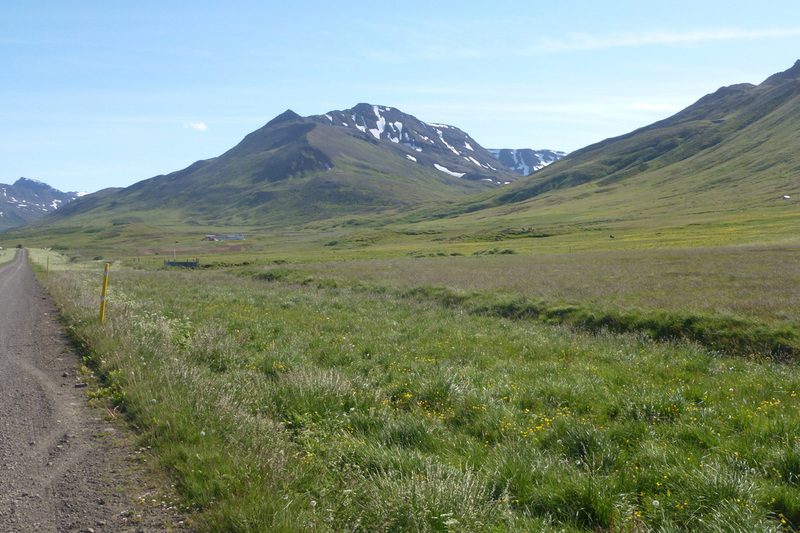 Four days later, on 26th April, it was over a thousand miles away at Álftafjörður in Eastern Iceland and was seen there on three occasions up to 1st May. On various dates between 9th August 2003 and 19th April 2004 our bird was seen at Cley although it did pop up to Snettisham for a while in September. Bizarrely it was back in Snettisham the following September before returning to Cley. A similar pattern continued until April 2007 although it did show up at Salthouse (not far from Cley) on several occasions. Álftafjörður on 30th April 2008.
it was in the company of many others of its species. 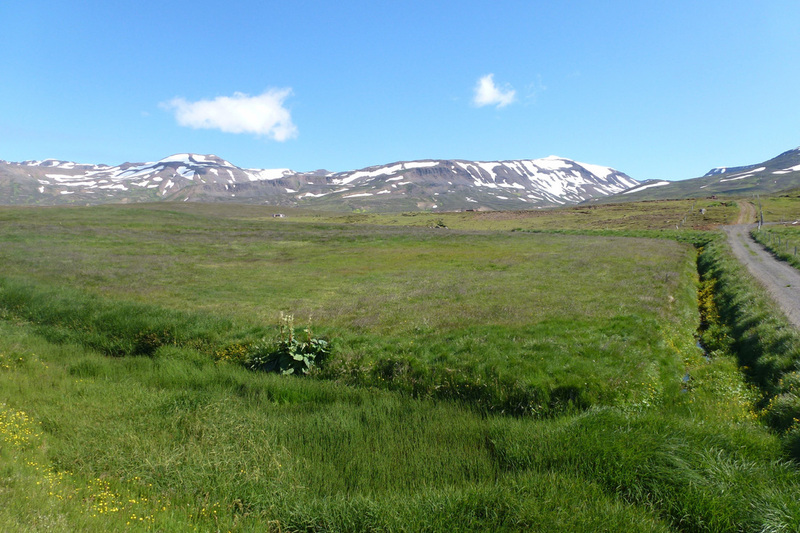 Thanks go to Jenny Gill, from the University of East Anglia, Peter Potts and Project Jadrakan in Iceland who provided the full details and photographs, which have been summarised here. 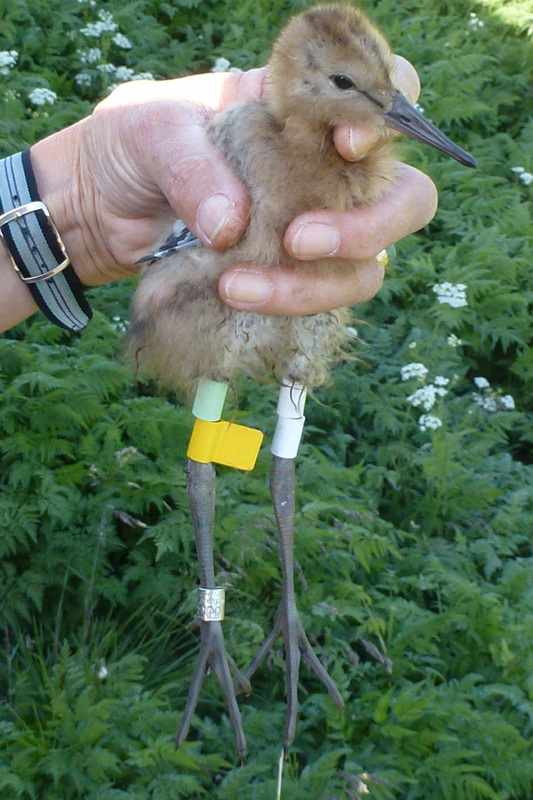 Last year ten young birds were found with colour rings. 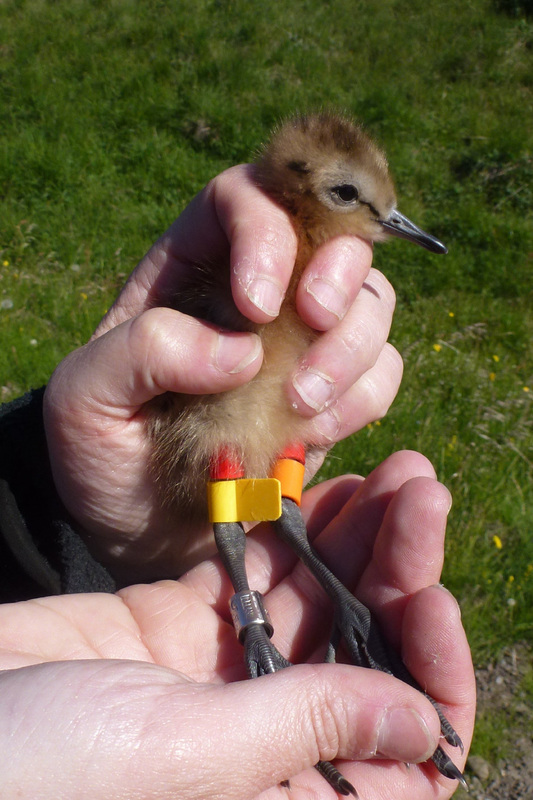 In one case two siblings were at Hale just forty days after they were ringed as small chicks. It takes about thirty days for them to fly from hatching and several more to improve their flying techniques! 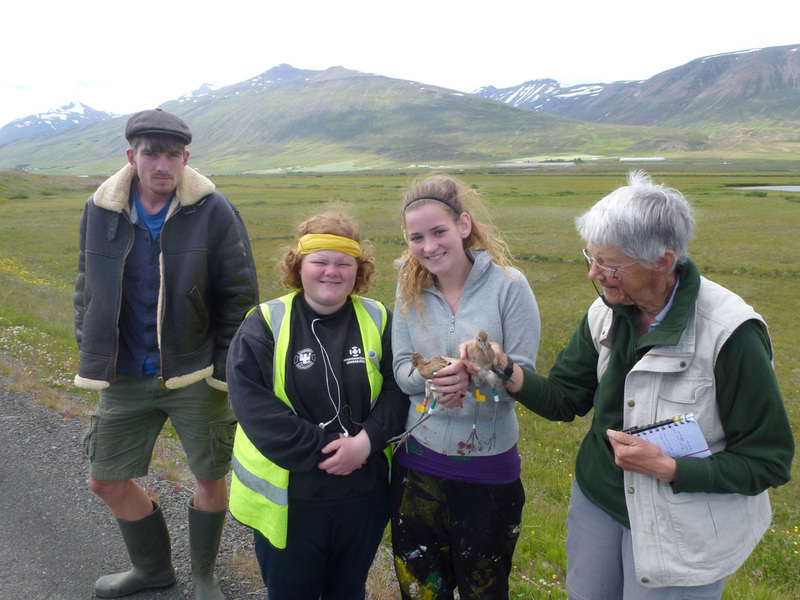 Another ringed at Fljot, Northern Iceland on 10th July spent twenty one days on the Estuary from 1st September. Our birds sometimes cross over to spend time at Frodsham and others have been found around Leighton Moss and on the Dee Estuary. availability of food being the main triggers to further migration. Some will move on south-east towards the Wash, others will travel further south into Spain and Portugal. Unfortunately in 2013 the vegetation was too long to read the rings with any degree of accuracy this year. were our birds were ringed. Two of the ringers in Iceland. Note the yellow flag used in combination with the colour rings. The two girls are from a local school. The ringers run an education programme as part of the scheme. WW-LYf. 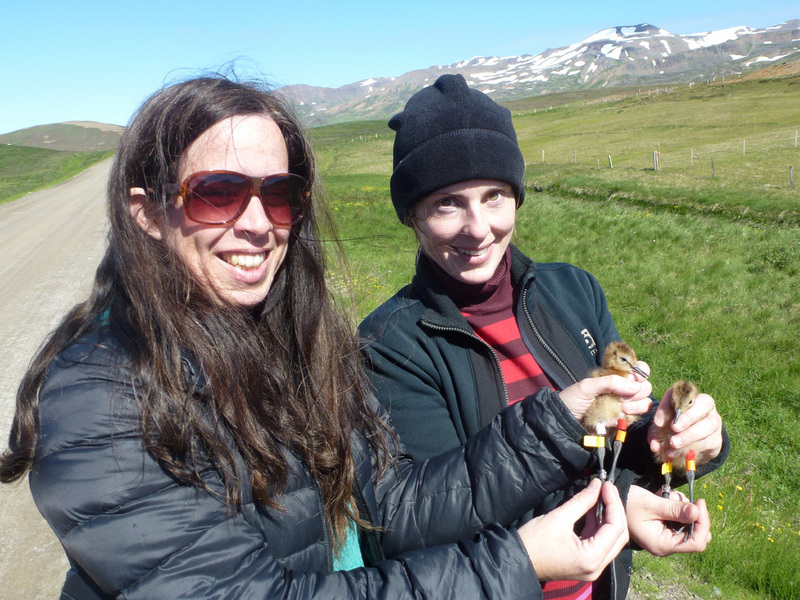 Ringed at 2 weeks old on 12/7/12 at Bergland, Northern Iceland. Seen Carr Lane Pools 20/9/12 - 30/9/12. GW-OYf. 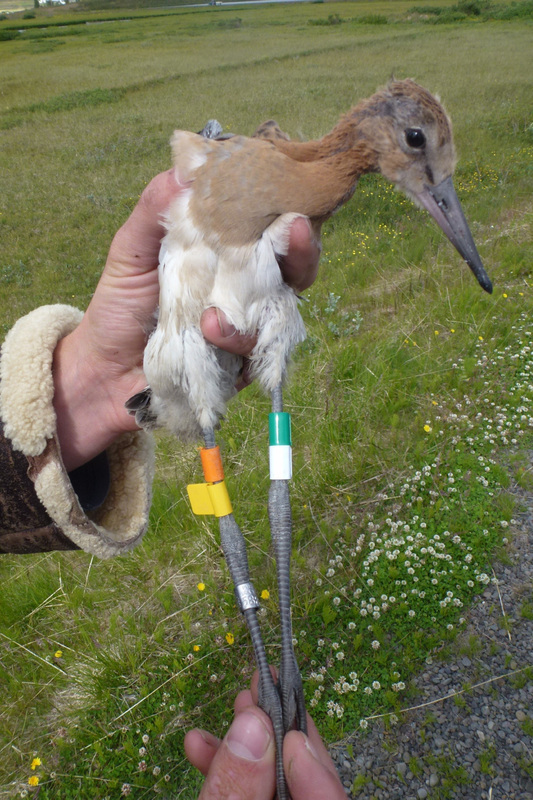 Ringed as a large chick on 13/7/12 at Dalvik, Eyjafjörður, North-east Iceland. Seen 20/8/12 at Frodsham & 27/8/12 at Carr Lane Pools. Another interesting colour-ringed black-tailed godwit has been seen at Carr Lane Pools. YO-YGf was ringed as an adult male on the Tagus Estuary, near Setúbal in Western Portugal on 20th February 2007. It has returned to the Tagus each winter: although it wasn’t seen in 2009! Travelling south in autumn it has been seen on the east coast on the Medway Estuary in Kent in 2008 and 2010 and on the Colne Estuary in Essex in 2012. Travelling north in spring it tends to have taken an easterly route too. In 2008 and 2010 and 2012 it visited Holland and in 2011 was at Lawling Creek on the Blackwater Estuary in Essex. This year it was interesting to see that it stopped both in France and UK on its way north! It was near Dunkerque, N France from at least 24th March to 15th April. 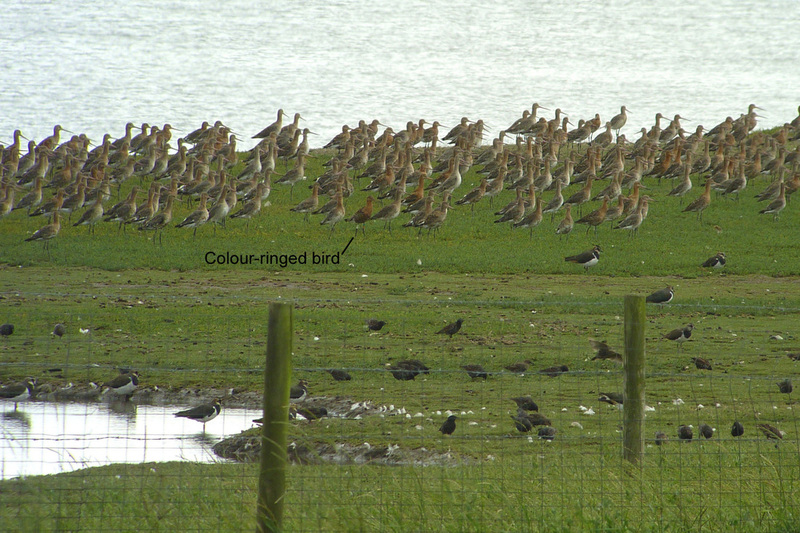 Three days later, on the 18th, it was on Carr Lane Pools with a flock of five other godwits. There had been a strong north-westerly gale the previous day, which had probably forced them down. They had gone by the evening. Some 2016 sightings of black-tailed godwits. Thanks for finding and reporting this bird. It is really great that it has been found once more. re-sighting (second English), is only the third re-sighted in Iceland but is the first to be seen in both! The ringing and resighting details to date are in the table below and previous observers are included in the circulation list as this is "their" bird too! 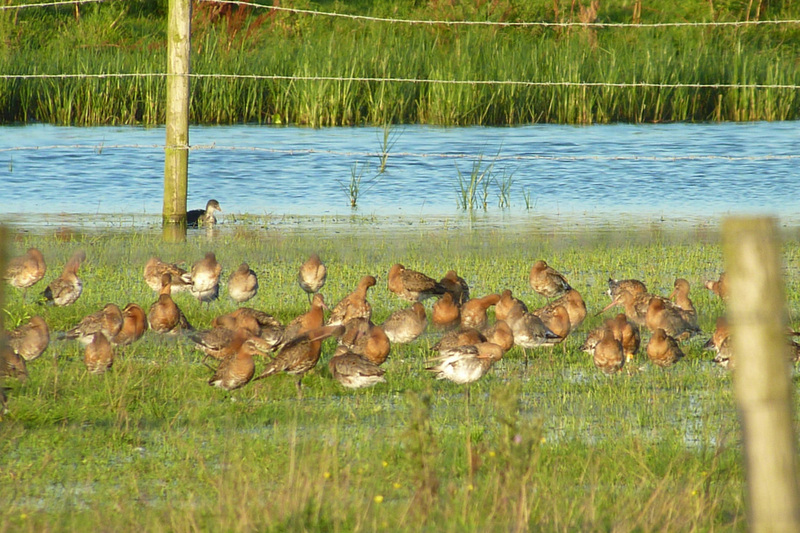 GN W in the black-tailed godwit flock at Carr Lane Pools.